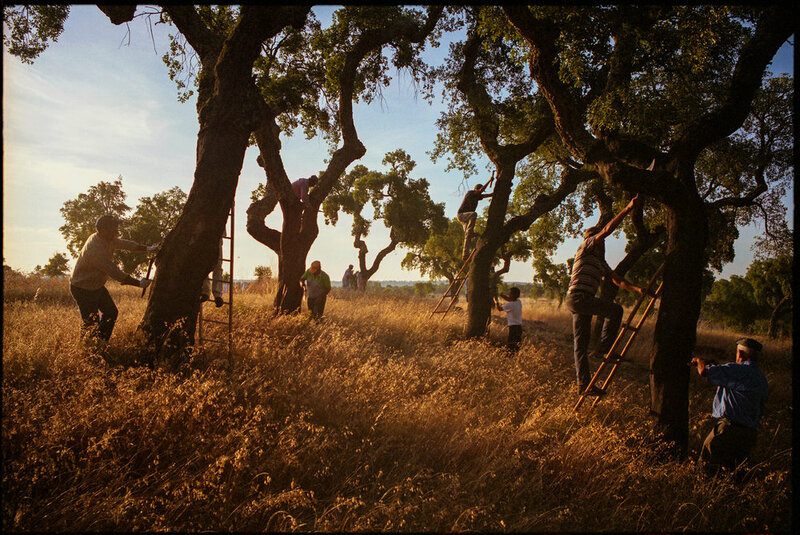 Each morning in the summer months cork harvesters fan out in Europe’s largest contiguous forest along the iberian peninsula and start their work amongst the oak trees that will be stripped of their bark and transformed into cork stoppers for wines and other beverages. While the workers go about their jobs with axes the trees are not harmed. The process of removing the bark requires both strength and precision: one has to strike the bark hard enough to make it through, but precises enough not to hurt the tree. It’s a practice that’s been handed down for many generations—and now one that’s well paid. Each day workers earn about €120 a day in rural areas that see a lot of unemployment. Ecologically the oak trees are essential for this region providing a habitat for the Iberian Lynx, and the short-toed eagle. In total they sustain 100 species and their root systems keep the soil from becoming too dry. Without them this landscape would become a desert without life. Yet as beneficial as these trees are to the history, economy and biodiversity of the region they are threatened. Climate change makes their sustainability a challenge, but so do consumer decisions. As vinters move away from cork stoppers and start implementing metal screw tops and plastic stoppers corks market share is dwindling. And with it these magnificent forests and the traditions of the workers who depend on this ecology to keep the region going. Billions of cork stoppers are produced each year—and making sure that they are not tainted is an important goal of cork sellers. After the cutting process in the fields the bark is transported to nearby factories. The process of transforming the bark into cork for spirits is a technically challenging one that employs many workers in the region. Each piece of bark is tagged and then analyzed to make sure that there are no impurities in the cork that would result in tainted wine.